Looks like a great selection of Bimotas. Enjoy the show, and the beers. 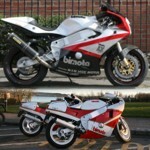 That looks impressive … beautiful to see all those Bimota’s … only where did you guys hide the SB6. I can imagine what fun it was to make the pictures. Especially with the lady’s and the teddy bear, one looks like a naughty schoolmistress and the other one looks like … naughty … you lucky b####rds. thanks for posting all these great pictures ! Great display - well done to all. Lots of people came...happy to see you all.........But a tremendous thanks to all the guys on the stand for their assistance....and to all who visited...it was great to see you alll...and "admin" at long last we met....thanks for keeping the site running and keeping us all together in "Bimota World"
Apologies to anyone I've forgotten to thank...and for those that I missed catching up with......it was MANIC all day today.......mostly because they upgraded us to a Dealer Prime position next to Main Dealers Yamaha and Suzuki.........indeed we took down more bikes than Honda Main Dealer...Ducati....Yamaha and Kawasaki......Oopppsss...didnt favour too well but we are "single minded"
Great show this weekend, home and bikes away. thanks to 2bims for the accommodation and hospitality.just relaxing with a beer!! Great photo's, I'll never clean the YB9 seat again! Good to meet you all again, sorry I couldn't spend more time on the stand and at the show. Very impressive sight see all the Bims together, some fantastic machinery on the stand. And as mentioned more bikes than the main dealers had on show. I got some photos, but no Lycra clad ladies. Strewth 2bims... couldn't you find a bimota shirt amongst all of your bimota stuff!